Earlier this week I joined the Yahoo! Group Soul Journaling. They give us weekly prompts that are very thought provoking and engaging to do. I chose these three as my first pages. I finished these last night and am quite happy with how they turned out. I wanted to share them with you. The page with no words, just photos is the Intuitive Collage. We were instructed to choose magazine photos that appealed to us and ‘spoke’ to us in some way. We needed to choose a background image and smaller images that overlapped it and we couldn’t leave any part of the white page exposed. I was amazed at how this came out. It was very intuitive. I found the life drawing page which represented my love of art and my desire to be an art teacher. The woman in the foreground, wrapped in the textured shawl is representative of me, being cold all the time (I’m thinking thyroid…have to get that checked out.) and the face of ‘me’ is a drawing I did a while ago. The clock represents time and how I never seem to have enough of it to accomplish all the creative things I have a desire to do. The sleeping cat is my symbol of comfort and the flowers make me happy. All these images came together almost on their own and made so much sense to me. By the way, the drawing I used to represent myself is hand drawn by me imitating a drawing by Cori. I created this one of a kind just for myself, to see if I could draw like her…I was able to and loved it and held onto it until I thought it would be perfect for this journal page. If you like her style, stop by her etsy shop and see her work…it’s amazing! 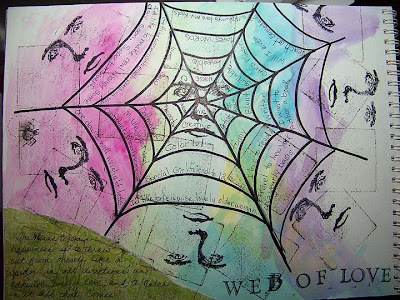 The Web of Love is an exercise where we draw a spider’s web and write in each space all the things we are, our goals and aspects of our personality. The idea of the web is to trap love. A quote is included in the green area that explains the ‘web of love’. 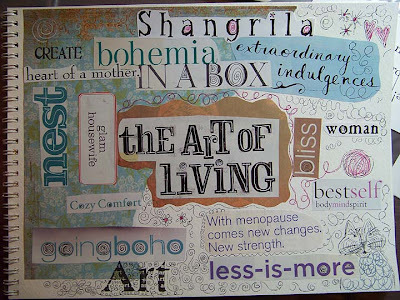 The Defining Word page is words that we are drawn to, words that have meaning to us. At the top is the word, Shangrila’ and that is my focal word. I love what it means, a utopian, exotic place of happiness-and that’s just what I’m searching for. I love that you are my soul sister, too! Love your web and defining pages. This journaling is so wonderfully creative, isn’t it? lol, love your guard cat 🙂 the journaling thing has been a life savor for me! These pages are so, so wonderful! Well done. You have a fabulous eye for design. I love the faces around the web. 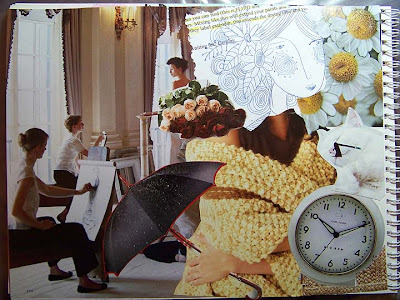 Your intuitive collage has a great layered effect. 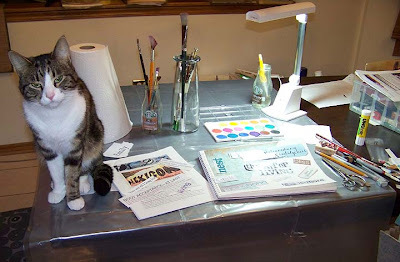 Are you familiar with SoulCollage? You are a natural! Shangrila is a fantastic word – love it! I have added you to the permanent blog roll. I was delighted to see my prompt printed out and pictured on your desk – how cool to see a bit of me and my work appear in another new environment. Wow! Welcome to the group. I can’t wait to see more from you. your pages are wonderful. love your faces on the web; the idea of more than one face is great bc we women wear all kinds of faces/hats. I like the art piece of time, trying to get started or finished on time. and you know a black umbrella is very elegant and regal to me. reminds me of an English man/woman carrying theirs and walking with it. Very proper.